What is Ba Lần Mẹ Khóc, whose title I have Englished as Thrice Mother Wept, opting for old-style “thrice” over “three times” in order to cut down on syllables? Like Tuổi Trẻ Chúng Tôi, it was recorded only once in South Vietnam. Although it could be found on YouTube and various Vietnamese music websites, no lyrics could be found online after several Google searches, further confirming its lowly status. My tiny contribution to the maintenance of Vietnamese music on the World Wide Web was typing up the lyrics and pasting them to the video below. I have not encountered another recording other than the original, or any recorded live performances in Vietnam or the diaspora. There are, however, three important differences between Thrice Mother Wept and This Is Our Youth. First, the author of Thrice Mother Wept, Hoài Linh, wasn’t obscure like Giang Châu but achieved a solid measure of success without belonging to the A-list of composers in the Republican South. Some of his songs were co-written, but this one was wholly his creation. Second, it was recorded by Khánh Ly, one of the most celebrated South Vietnamese vocalists. Khánh Ly has always impressed me as someone who rarely erred in her choices of songs for first-time recordings, and this one was no exception. Last and not least, the recording was included in the fourth and last album released under the label Chế Linh, another popular singer in the South. 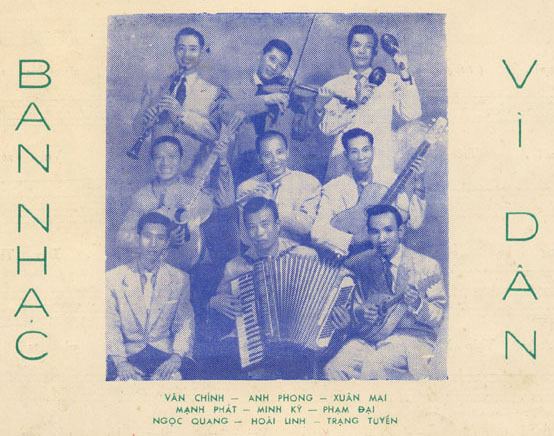 Like most successful commercial series, this label showcased established vocalists in the industry, not one-time or less-known singers like Giang Châu and others in the Du Ca album. Here is the recording in entirety. Why is Ba Lần Mẹ Khóc little known? One possibility, as Jason Gibbs suggested to me recently, was the economic downturn in 1974. It was the year of the album’s release, and probably fewer people purchased the latest addition to the Chế Linh series than before. This is a plausible reason, reinforced by the relatively lesser-known status of most songs in the album. Its semi-obscure status notwithstanding, Thrice Mother Wept is, in my opinion, a terrific song that deserves more listening. Musically, the structure of the song is ABCAB, which was not common at the time. (Or is it ABCDAB? Is there such a form?) It opens with a slow hook, started by an uncommon joint sound of flute and accordion. My appreciation goes to Jason and Ryan Berndt, who independently identified the instruments. The bass and electric guitar join them a few seconds later and, characteristic of this period, the introduction goes on for half a minute. It is a mildly hypnotic hook, the sort that puts one into a slight daze were it played over and again. What’s about the lyrics? If This Is Our Youth tells grievances and declarations, Thrice Mother Wept shows a series of appeals, starting with an appeal to familial sorrow in the first verse. The sorrow is very personal yet easily recognizable to Vietnamese at the time due to many young deaths. Note: I decide to go for rhyming in this translation, and include some annotation in italics below. Mẹ coi như mất đứa con trai đầu lòng. She feels to have lost her first-born son. A literal translation of the second line is, “At mid-spring, mother bid farewell to her husband.” “Mid-spring” means she was not yet middle-aged. The appeal is strictly on familial terms, and all losses have to do with the most important men in the life of the mother-speaker: father, husband, and (oldest) son. The thinking was aligned to the gender-specific hierarchy and lesser status for women accepted by conservative Vietnamese. Details about the son are unclear. But the association of his moral dissolution to two major and presumably early deaths – it will be revealed that the grandfather was killed as a member of a colonial resistance movement – means the psychical wound was large and the disappointment deep. In the second verse, the mother appeals directly to the son and makes known her wish for him. Most of all, her wish moves from the family to the nation. The bass gets busy at the end of the second line. The electric guitar gets out of the way to make room for the violin. Đừng vôi vong giống dòng. In the last line, Hoài Linh follows the momentum of vong ân in the previous line and cleverly invents a new verb, vôi vong, to mean approximately the same thing: to disappoint. The last words of the last line, giống dòng, could mean either ethnic ancestry OR familial ancestry. His use is wonderfully apt here. The second verse is arguably the most crucial passage because it ties the personal and familial to the national. There is no separation of the private and the public in this view. The Vietnamese son is expected to assume responsibility and obligation to both family and nation. The fact that his father and grandfather had died only makes the task more urgent. Having set the stage, the song reaches its climax in the chorus, where Khánh Ly’s voice leaps and makes an unabashed appeal to the popular essentialist trope that Vietnam is rooted in a “thousand of years” of civilization and that Vietnamese are bound to one another on the basis of this history. Instrumentation shifts accordingly. In the previous verse, the violin gradually builds up a rhythm of staccatos. Now, staccatos take over completely and create a heightened background for the lyrics. Máu đào xương trắng đầy. Cũng họ hàng đấy mà. Red blood and white bones forged it be. But related to one another. The lyrics then shift back to family, but firmly in the context of national history. The electric guitar and flute return to smooth over the transition. There is an unusual feeling of tender firmness – or firm tenderness – in this verse. Còn con, còn con sao hèn vậy? Đứng ngoài nhìn khói bay. Now you, how could you be so craven? Standing by when our house is on fire. Watching it in smoke like an outsider. This passage is most remarkable for the use of hèn in the third line: Còn con, còn con sao hèn vậy? The most common word for cowardice in Vietnamese is nhát – cowardly, wimpy, afraid – which connotes the sort of cowardice based on habit and disposition. Nhát gan, for instance, literally means lily-livered. Slightly less common is the adjective hèn which points squarely at a grave failure to stand up to one’s responsibility. It isn’t typical cowardice, but closer to spinelessness, gutlessness, or cravenness. In addition to other appeals, the mother issues a moral challenge to the son. She appeals to his honor, duty, and identity as inheritor to an illustrious tradition. Đừng như đom đóm tối tăm nơi bụi bờ. But into future your life will stay. Not like fireflies hover in dimness. Chỉ hơn nhau tiếng đời. Given the steady pleading, “right direction” is clear by the end. It means standing up and performing one’s obligation to the family and nation, which are taken to be the basic group identity of the Vietnamese young man in the song. No specific resolution or program is spelled out for him. But Hoài Linh served as a military officer and the time was Vietnamization, when the Republic needed many able bodies for the army. It isn’t unreasonable to think that he meant to call on young men to enlist and fight the communist enemy. In my view, Ba Lần Mẹ Khóc illustrates a more moderate and even conservative variety of Vietnamese nationalism, which followed a different trajectory than that advocated by the communist revolutionaries. 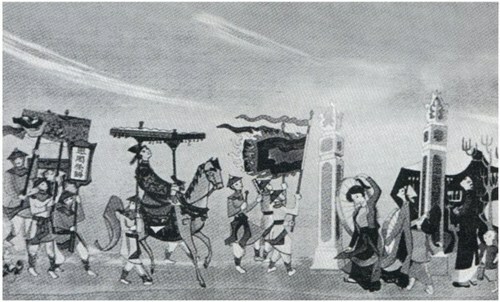 Cultural programs and musical productions of the DRV and the NLF deployed essentialist tropes about Vietnamese civilization. They also elevated rebels and revolutionaries against French colonialism and other invaders. But similarities stopped there because the DRV also insisted on the vanguard role of the Communist Party in all matters pertaining to the Vietnamese nation. Nationalism was inevitably bound to the Party and, eventually, the socialist revolution. In this configuration, there was little if any room for the family. For sure, nationalism in South Vietnam spoke of cách mạng or revolution. At the same time, it was more diffuse in content, more cautious of its limitation, and wary of ruptures that a radical revolution could foster in postcolonial Vietnam. I am not versed enough in theory to determine whether the Gramscian concept of passive revolution could be applied in any meaningful way to this kind of nationalism. Gramsci might roll in his grave from hearing about this possibility. On the other hand, he seemed to have a greater if grudging respect for tradition than your average Marxist thinker. All the same, this nationalism opted not to upend the existing social order, at least not openly and rapidly. It preferred to go along with social tradition and norms, maneuver around them, and co-opt them when possible. It did not shy, for instance, from appealing to an older-fashioned notion of shame and honor and reputation as motivation for one’s responsibility to the country. Most of all, this nationalism saw no necessary contradiction between family and nation but even encouraged an intimacy between them. It considered the family as a foundation for the nation, if not the foundation, but it also imposed responsibility and obligation to the nation upon the family. Nation and family were two sides of the nationalist coin, and they were promoted to interact closely and continuously. Last but not least, a motherly figure rather than a political party stood at the center of this nationalism. True, she might be the mother of this or that Vietnamese son. But she was also a prime symbol of the nation and a major motivator among Vietnamese for their love of and duty to the country. I don’t see anything remarkable about the form – (AB)C(AB) is just another way of realizing the typical ABA form of Vietnamese pop music. Arguably what is heard as (AB) is just an extended A melody. Thinking more about the dating of the song – it’s likely that it appeared in early 1975, late 1974 at the earliest. A better explanation of the song’s obscurity is that It had very little time to enter into the communications media of the south before the south existed no more. Thank you for transcribing the lyrics – I think you meant “mẹ sinh ra” instead of “mẹ xinh ra” (though it’s nice to think of her beauty coming forth). This song is a great illustration of one of the characteristics of many RVN song lyrics — an assumption that the creators and the audience aspire to an traditional, educated, middle class life, a personal ambition that they are setting aside for reasons of nghĩa. This is unheard of in the songs of the north of that time – nobody is giving anything up. They can’t wait to fight. I feel like songs like this one ignore the peasants, laborers (who probably made up the non-commissioned men in the armed forces), except to the extent that they share the same ambition that they cannot take part in – war or no war. And as you point out this is expressed in the dated language of the imperial examination system. I interpret this to mean that his grandfather and father suffered at the hands of the Việt Minh. This couplet may be even be autobiographical. Hoài Linh was from Hải Phòng and likely spent time in the resistance zone, maybe with relatives. 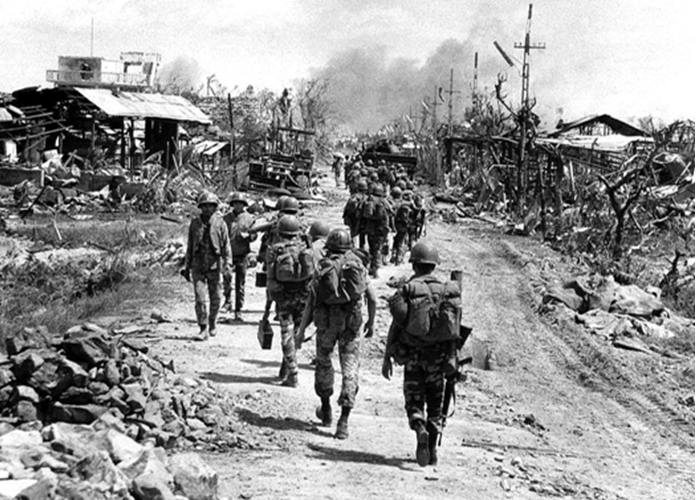 The French violently took over Hải Phòng in 1946 and many city residents moved to the country. His own father had been a sailor for the French. I’m not sure whether Hoài Linh was in the armed forces. He joined the police force in 1953 and I think worked for them until 1975. I should have asked his wife what work he did after 1975. The Vì Dân group you show above was actually the Ban Nhạc Cảnh Sát. Hoài Linh’s son was a member of the RVN Air Force. I don’t know how he fared after 1975. Thanks for your sharp eye, and “xinh” has been corrected above and on YouTube. I thought the form wasn’t common only because the majority of songs in SVN were written AABA. Otherwise, no, it’s nothing special. I thought of the AA’ variation too. Is it possible to call it AA’BCAA’? On dates, I wish albums and tapes were printed with both year and month of release, the same as books in South Vietnam. Anyway, late 1974 sounds right. I think you’re right too that HL was in the police, not military. His son Tuấn Lê, who also wrote music, died seven or eight years before him. I don’t know where he died, and it’s terrific if you can find out more from his wife on various details. On the two lines you quote, I think the deaths of grandfather and (possibly) father are attributed to anti-colonial resistance than the Vietminh. I don’t think it’s necessarily autobiographical in this case, since the mother stands for the nation (and by extension her father and husband stand for generations of nationalist Vietnamese). The grandfather for sure. “Kháng chiến,” even when used by contemporary noncommunist Vietnamese, almost always meant fighting against the French. It struck me as a sore point for anticommunists, at least those who participated in the early phase of the First Indochina War, that they never received credit for resisting the French because the Vietminh completely took away the anticolonial mantle and credit after ĐBP. I really like your point on the peasants and laborers. Nhạc vàng romanticized the peasantry and the countryside a great deal, but I’m not sure how much the composers grasped the situation of peasants and small-scale farmers. It’s a great point that I’ll need to think more about.